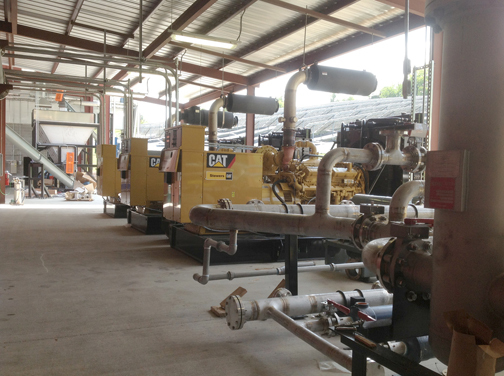 Hydrogen created from biomass sources at Wampler’s Farm, is pumped into these generators where it can be converted into useable energy for the sausage making company in Knoxville. In the background, left, is the Proton Power biomass small particle (4mm) feed system that feeds biomass into a storage bladder where the hydrogen is produced. In the background at right the 500 watt 5 acre solar panel array can be seen. Ted Wampler Jr. used to be strictly in the business of making pork sausage. How that process impacted the environment wasn’t really anything he thought or worried about. But his whole world has changed since he discovered alternative energy solutions and the installation of the first solar array on his farm property in 2009. “Prior to ’09, I was trying to destroy the planet, and now our corporate philosophy, our corporate culture, is definitely about sustainability,” he explains. The company got its start in 1937 when Wampler’s grandfather, Riley Wampler, bought $38 worth of materials and supplies to build a tin building near a creek to slaughter hogs. Today, Wampler’s operates out of a state-of-the-art facility powered entirely by sustainable energy, selling its products in nearly 40 states. So why exactly did Wampler do such a radical turn? It’s all about economics. In 2009, the vice president of the company, Martin Flanary, wanted to see what they could do with solar power, so the company installed their first 30,000 kW system. At that time, Oak Ridge had the biggest solar array in the area at 25,000 kW, so they went just a bit bigger. “We got so much interest in that solar project, big hoopla and balloons and celebrations, and politicians coming to talk,” Wampler says. So the attention pushed them to do even more. They began recycling water through a conservation program and instituted cardboard and plastic recycling. In 2011, Wampler installed a second 500,000 kW solar power field beside the plant, then completed a public partnership was the Knoxville Zoo, installing a 50,000 kW system on top of the elephant house. Another one went in over at Family Brands, a sister company to Wampler’s Farm Sausage. It was during that time that Wampler was introduced to Dr. Sam Weaver at Knoxville-based Aries Energy. Weaver is the founder of Proton Power, a commercial-grade biomass renewable energy system. The very first system installed by Aries was at Wampler’s in 2011. Wampler’s goal is to be Net Zero, producing no electric bill, and it’s something he can see achieving with the system’s technology as the system burns waste to produce inexpensive hydrogen. The gas produced is through a process called Cellulose to Hydrogen Power, or CHyP, and provides low-cost electricity. Basically, it produces hydrogen on demand. Wampler says visitors from all over the world have been coming to East Tennessee to learn more about producing cheap hydrogen on demand out of waste. “That technology is just mind-blowing because we’re harvesting hydrogen out of biomass at atmospheric pressure and then combusting the hydrogen to make electricity,” he explains. “Dr. Weaver’s technology provides energy every way we know energy, because you can flare hydrogen so that there’s heat energy, so when you think about combusting coal, so at the steam plant, or making bricks, or smelting zinc, or whatever you might be doing heat for energy. “Electricity, which is what we’re specifically doing at our facility, and then of course liquid fuel. “This is seriously like putting the banana in the DeLorean kind of stuff,” he adds, referring to the iconic vehicle that used garbage for fuel in the “Back to the Future” movie series. Wampler says the company’s commitment to sustainability has no bounds now, especially since one of the byproducts from Weaver’s process is something that everybody’s going to want – graphene. Graphene is a nearly transparent thin layer of pure carbon that is about 100 times stronger than the strongest steel and is an efficient conductor of heat and electricity. “It’s the best, fastest capacitor ever discovered,” Wampler says. “It just does so much for cleaning up the planet just with that. “We’re talking about a whole different kind of energy storage, so no more wasted energy. “This can be [used] so much for medical. When you think about the future of this planet in the year 2050, and all those grandchildren of our customers, we’re going to be fighting over water and food if something’s not done.